Our mission is to provide affordable housing for independent, low-income seniors. Since 1968, Stevenson House has offered a solution to the continuing housing crisis low-income seniors face. 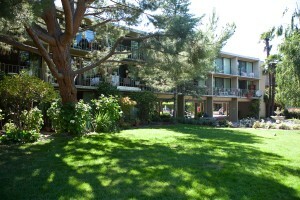 To fulfill our mission, the property is situated on 2.9 acres, Stevenson House is home to about 167 older adults. Our residents enjoy independent living as part of a greater community of their peers, making their home in one of our three low-rise buildings in either a studio or one-bedroom apartment. All apartments have a full kitchen and bath. Amenities include: A computer in the library, some classes, and a Main Floor Lounge with a big-screen television. Outdoor areas throughout the property provide a settings for walking, gardening, and sitting at tables and benches. We are adjacent to Mitchell Park and the Unitarian-Universalist Church of Palo Alto. Public transportation and shopping are also within easy reach.